Antibody-dependent cell-mediated cytotoxicity (ADCC) is one of the mechanisms of action of antibody drugs. Effector cells, such as natural killer (NK) cells and monocytes, recognize target cells (such as cancer cells) that have been bound by an antibody. Upon recognizing the antibody, the effector cells then destroy the target cells by releasing cytotoxic factors that induce cell lysis. In this application, ｗe performed a three-dimensional co-culture experiment using human colon cancer cells (HT-29) and NK cells (KHYG-1) expressing a functional Fcgamma (FCγ) receptor in the presence of human EGFR-targeted therapeutic monoclonal antibodies, and observed them for forty-eight hours using the FLUOVIEW FV3000 confocal microscope. 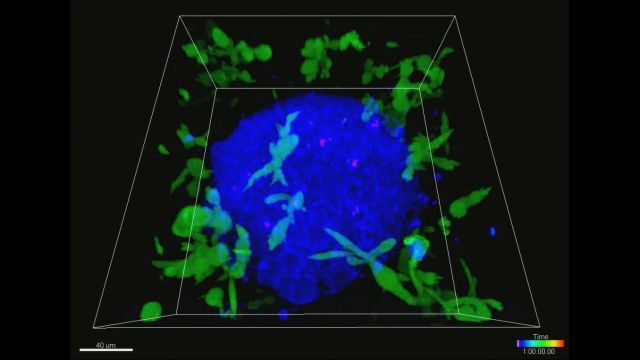 The resulting three-dimensional (3D) imaging of ADCC enabled us to capture how NK cells attack cancer cells. Cell masses grown in a 3D culture system (called spheroids) are difficult to image due to the thickness of the mass. Higher excitation light intensity is typically required to produce a fluorescent signal strong enough to be detected. However, higher excitation light also increases phototoxicity, resulting in damage to the cells. To combat this, we used the FV3000 microscope, which incorporates Olympus’ TruSpectral detection technology to capture weak fluorescent signals and minimize the laser power required for signal generation deep within a spheroid. 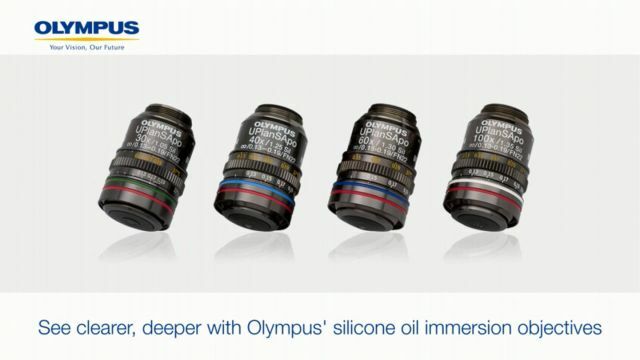 Furthermore, we used a 60X silicone oil immersion objective (closely matching the refractive index of live cells) to achieve brighter images with higher resolution for deep observation. By combining these two technologies, we successfully captured bright 3D time-lapse images of a spheroid for 48 hours, as it collapsed due to NK cell-mediated HT-29 cell death. NK cell line KHYG-1 (green) expressing functional Fcgamma (FCγ) receptors and ZsGreen fluorescent proteins were cultured with spheroids of HT-29 cells (cell lines derived from colorectal cancer). The surfaces of HT-29 cells were labeled with anti-EGFR monoclonal antibody cetuximab (Alexa Fluor 647, blue). HT-29 and NK cells were cultivated in the presence of propidium iodide (PI), and XYZT imaging was performed over the course of 48 hours. Nuclei labeled red (marking cellular uptake of PI) was used as an indicator of cell death. For experiments that evaluate the effectiveness of antibody drugs, long-term imaging of live cells is indispensable. To more precisely capture the effect of NK cells on spheroidal cancer cells, we used a Z-drift compensator (IX3-ZDC2) to prevent changes in focus due to external environmental changes such as temperature variation. The IX3-ZDC2 enabled us to obtain a time-lapse image over a long period without losing focus on the spheroid. This enabled us to confirm that the NK cells actively change their shape while attacking and entering the tumor mass. Fig. 2: NK cell line KHYG-1 (green) changing shape while attacking and killing HT-29 tumor cells labeled with cetuximab (blue). PI uptake (red) indicates cell death. The IX3-ZDC2 Z-drift compensator uses minimally-phototoxic infrared light (laser class 1) to identify the location of the sample plane. One-shot autofocus (AF) mode enables several focus positions to be set as desired for deeper samples, enabling efficient Z-stack acquisitions in multiposition experiments. In recent years, the demand for fluorescence imaging in cancer research has been increasing, as have the number of experiments required to sterically evaluate the effectiveness of antibody medicine—especially with spheroid cells. Spheroids are very difficult to observe using fluorescence due to their thickness, but by using the FV3000 microscope, we were able to observe spheroid cancer cells throughout their entirety for 48 hours. Throughout the ADCC experiment, we were able to accurately measure living cancer cells, dead cells, and effector cells (NK cells) as they responded to the antibody treatment. I felt the FV3000 was very effective for evaluating the therapeutic effectiveness of antibody medicine.